2007 Phillies: The Team to Beat, Indeed! 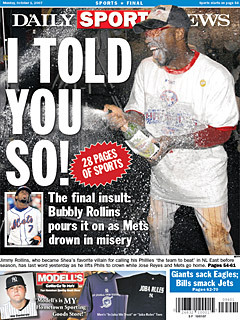 Congratulations to the 2007 National League Eastern Division Champion Philadelphia Phillies! As Phillies shortstop — and NL Most Valuable Player candidate — Jimmy Rollins (below) said before the season began, the Phils were “the team to beat” in the NL East. Oh, and one more thing…note to Mets manager Willie Randolph and catcher Paul Lo Duca…we’re sipping champagne and dancing on the field…what are you doing now?